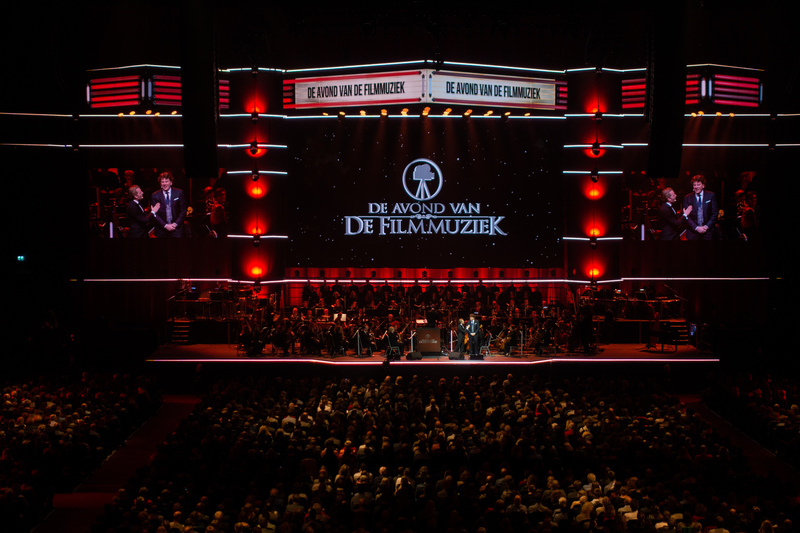 “De Avond van de Filmmuziek” (Evening of Film Music) is the biggest film music concert we have in the Netherlands and this year we were celebrating its 5th birthday. The previous four concerts were held in one of the country’s best concert halls: “Het Concertgebouw” in Amsterdam. I have attended the 2017 and 2018 concerts. 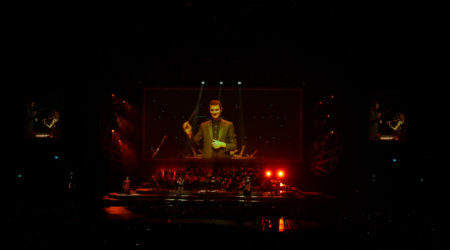 In the last edition, the host proudly announced that the next edition would take place in the much larger Ziggo Dome. 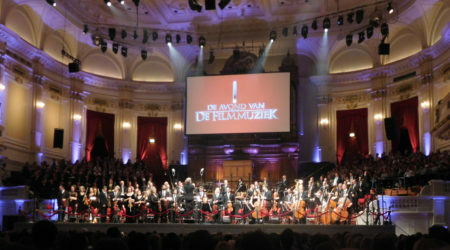 When I heard this announcement I felt uneasy, because that would mean leaving the beautiful “Het Concertgebouw” behind – A venue where no amplification is required to create beautiful natural orchestral sounds – and exchanging it for a massive venue, capable of housing more than ten thousand people but not built for orchestras, where amplification of the musicians is mandatory. After the huge hall was filled with over ten thousand attendees, The Metropole Orchestra, with Jules Buckley at the helm, started to play the standard introduction for this concert with the piece “Also Sprach Zarathustra.” Within the first couple of notes, it became clear that a lot of effort was put into the production of the show, with a lot of amazing light effects. The sound was also better than I expected from a huge hall like this. The rest of the program can be divided into two categories, namely film music and non-film music. I know this is a weird statement for a report about a film music concert, so let’s talk about the non-film music category first. 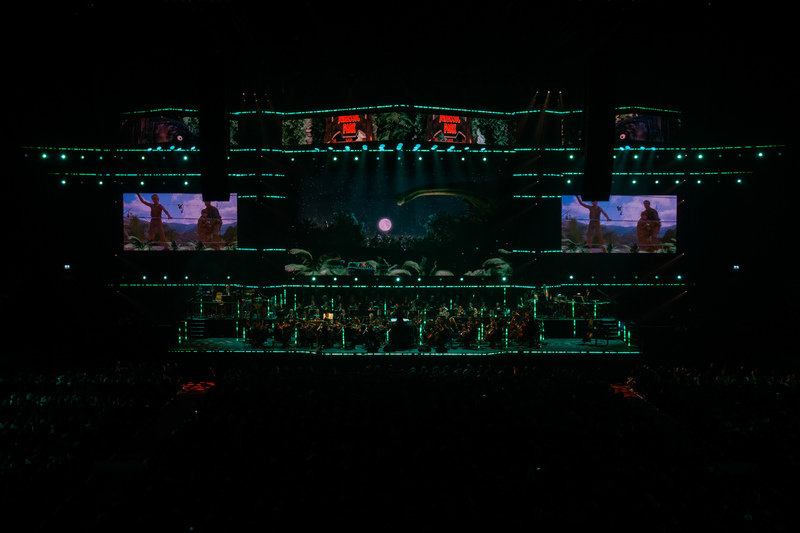 The biggest problem with film music in the Netherlands is that it is not popular at all and this concert was also produced for television. Being in the Netherlands, it will only air after 11 PM, but at least it is being broadcasted at all. 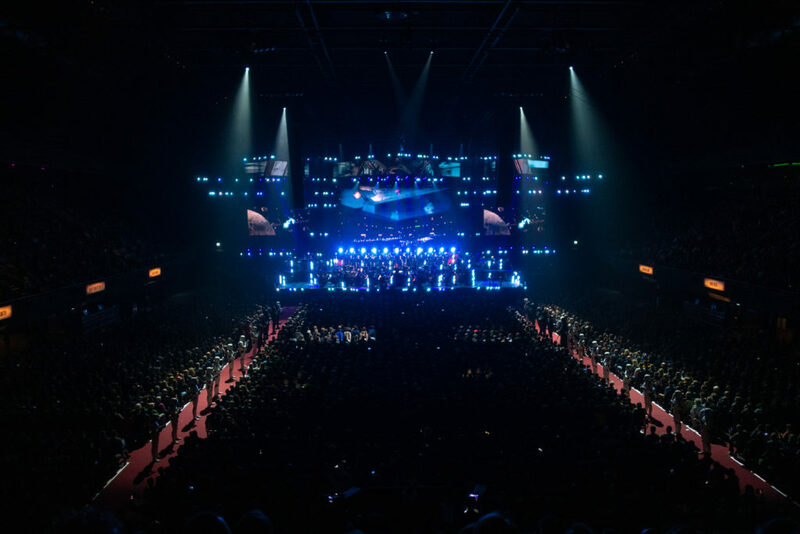 In order to fill the Ziggo Dome and to get people to watch the show on television, the producers are focussing on a high entertainment factor. The audience must have a great time and people need to have smiles on their faces when the concert is over. 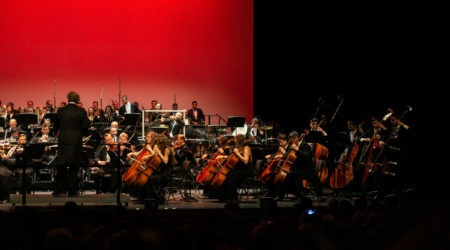 Another factor is that The Metropole Orchestra is also well-known for playing light, jazzy music, and are very experienced in supporting an artist. The best way for the organization to combine these two factors is by inviting famous singers. Last year, a couple of movies came out that were perfect for songs. For the movie A Star is Born Noortje Herlaar sang “I Will Never Love Again” and Jeroen van Koningsbrugge and Nona sang “Shallow” together. Trijntje Oosterhuis is a very popular singer and she was going to perform at her own concert with The Metropole Orchestra in a sold-out Ziggo Dome the day after. A smart move, since they could reuse all the stage assets. I am not sure when they decided to let her sing Titanic’s “My Heart Will Go On,” because it totally looked like she was not prepared for this performance at all, and she had to read the lyrics from a monitor, which felt very unprofessional to me. Another movie hit of 2018 was, of course, Bohemian Rhapsody, and for that Roel van Velzen came on stage to sing the famous Queen song, which was quite impressive – especially the middle part with the orchestra and choir. It was a magnificent performance, but as my friend, who sat next to me, stated: “That was brilliant, but it is not film music.” As the encore Daniël Boissevain and Frank Lammers did an outstanding version of “Everybody Needs Somebody” from The Blues Brothers, which ended with a literal bang: fireworks going off inside the building. The last piece in the “non-film music” category is “O Fortuna” from Carmina Burana, during which images of Jackass were shown on the screen. The rest of the program, besides many educational and entertaining sketches by the two hosts Dominic Seldis and Peter Pannekoek, consisted of film music. They were almost all well-known film music pieces, and, with the exception of a brilliant version of Mission Impossible: Fallout, they were not from recent movies. Gladiator and Pirates of the Caribbean were played a bit too formal and would have needed a little more drive. Other pieces like, for example, “A Kaleidoscope of Mathematics” from A Beautiful Mind, with Noortje Herlaar singing, Schindler’s List performed by violinist Noa Wildschut, Soldaat van Oranje, which has been recorded by this orchestra many years ago, were all well done. For “Una Mattina” and “Fly” from Intouchables, harpist Lavinia Meijer played the piano part on her own instrument, which was quite interesting, because the harp left more space for the orchestra. For Star Wars the Star Wars cosplayers from the 501st Legion were present once again, and on the screen you could see the roof of the concert hall open up and ships flew in while the Legion was shooting at them. This augmented reality feature was a nice new touch for this concert. The rendition of “Lux Aeterna” from Requiem for a Dream could have been excellent, but one of the trombone players was improvising with a mute at the beginning of the piece, which was, in my humble opinion, not a good call and made me dislike the performance of this piece. When he stopped, the gorgeous piece, written by Clint Mansell, became so much better. As stated before: this orchestra really shines when it plays lighter music. There were many extra musicians like saxophone players, guitar players, drummers and more, which were used in a lot of amazing performances, e.g. James Bond, “Glory Days” from The Incredibles and my favorite piece of the night by far: “Gonna Fly Now” from Rocky. When the concert was over, the date for the next edition, which will take place in Ziggo Dome again, was shown on the screen. This announcement indicates the new path the organization is taking with “De Avond van de Filmmuziek.” Instead of three nights in “Het Concertgebouw” they will be trying to entertain a bigger audience in the new venue. It has its advantages, since you only need to book the artists for one night instead of three times in a row, but some film music, like Gladiator would have sounded much better in the old location where amplification is not necessary. On the other hand “Bohemian Rhapsody” would have been horrible acoustics-wise and with no room on the stage of “Het Concertgebouw.” I think we can expect an even sharper focus on entertainment for the next edition. Looking at the program of the previous years I see another problem: Apart from the songs a large part of the program had already been played at the previous two editions. If they want to continue this concert series successfully, they need to improve the variety in their choice of film music, instead of relying on the well-known classics. There is so much beautiful new film music out there, which is suited perfectly to be performed in concert halls. I really hope they will start looking for other pieces again like they have done in previous editions. I would also like to hear more Dutch film music at these concerts, because it is not well-known, and this concert would be a great tool to get music from Dutch composers more attention. On a more positive note, the concert was exactly what I was expecting. Especially the light film music was fantastic to listen to, and even “Bohemian Rhapsody,” while not being film music, was amazing with the orchestra and choir. That is something I would not have heard live otherwise. The light show and also the sound in Ziggo Dome was done well. The large stage allowed for more all-around entertainment. I am really hoping that through these concerts, more people will be led to explore film music and to visit other concerts as well. For example in “Het Concertgebouw”. There are at least two great film music concerts scheduled in July. I definitely hope at least that the next editions will sell out as well, my tickets have already been booked, since I am quite curious about the path this concert series will take in the future.